Ever had the peacefulness of a bright summer’s walk snatched painfully away by an accidental brush with a stinging nettle? Has a blackberry foray ever found you abandoning the brambles in search of a dock leaf to nurse a throbbing sting? Ever come off your bike to land face first in a billow of these prickly pests, and limped home, tears in your eyes, aching for the ease which only camomile can bring…? Well I have all three, and very unhappy I was, too. But, have you ever realised that you can eat this vicious offender? Well, the chances are that you have. Apart from the wealth of puddings, pies, jams and jellies that are routinely made and enjoyed from the humble blackberry, stinging nettle soup is probably what most people first think of when it comes to foraging for food. And well they might, for it is delicious, and of course you get the added pleasure of devouring the countryside’s most wantonly malicious of weeds. So where better to start our adventure with wild food? 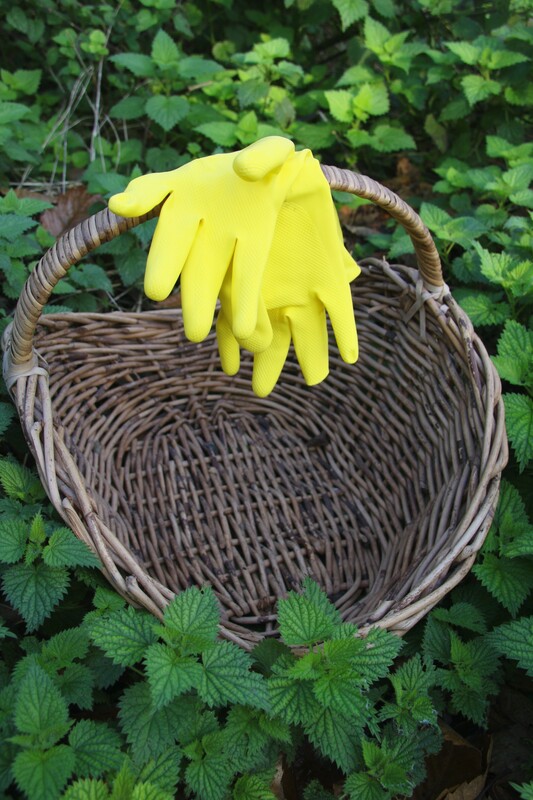 A pair of thick gloves, so to avoid any further stings (marigolds are perfect). A plastic bag, basket, or container in which to collect your spoils. 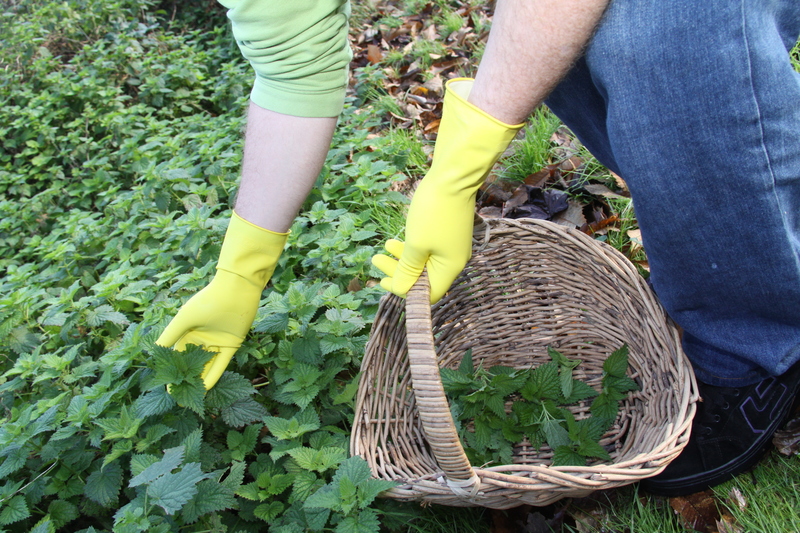 Spring is best time of year to collect nettles, when a whole young plant may be pulled and added to the pot. But, as you may be stung all year round, so may you feast. Now in November you’re just looking for the six or so young leaves that form a criss-cross at the plant’s tip. Just pinch these off with a gloved hand and bung them in your basket or bag. Visit my Edible Greens A-Z page for further pictures and full description. Now, the wilier amongst you may have noticed the 4 items in my basket at the top of the page that look nothing at all like stinging nettles. One of the great excitements of foraging is that you never know what you are going to find. And this time was no exception. Just a few metres away from the nettle patch were growing a few truly excellent specimens of the edible and delicious Shaggy Parasol – one of the tastiest and easiest-to-identify mushrooms of autumn. Watch this blog for more on these tousled treasures. The risk of little ones being stung (and big ones, for that matter) is always a real one when collecting nettles, and I don’t think I’ve ever gathered a basketful without succumbing at least once to the nettle’s prickly charms. So, if you are worried, it is perhaps best to keep the very young to just holding open the basket or bag (with gloved hands) while you get stuck in, or just keep them away altogether. Try out my recipe for Stinging Nettle Soup for something to warm you up after a hard day’s foraging. 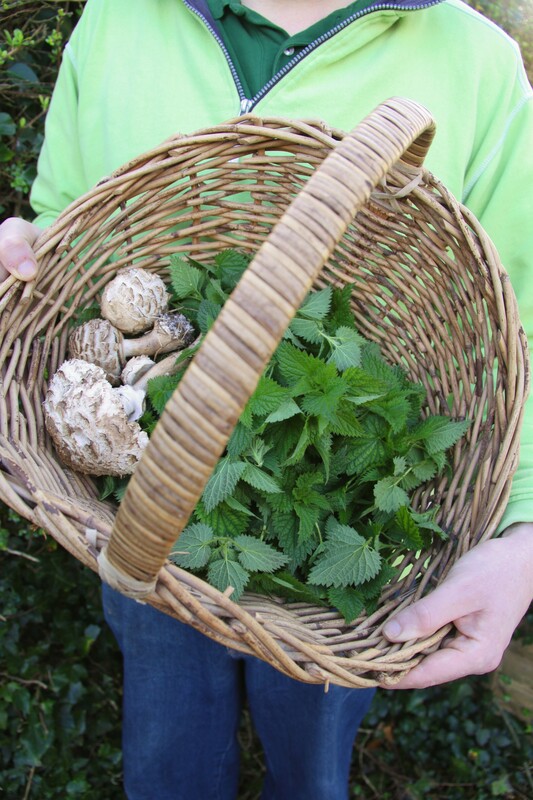 This entry was posted in Edible Greens, Uncategorized and tagged family activities, foraging, free food, nettle soup, wild food, wild mushrooms. Bookmark the permalink. Think I’m definitely gonna try this. Never tried a nettle dish before, but I’m always in to trying new stuff. Love the blog. I had my first go at sea-foraging the other day and really enjoyed it! Hello! What did you forage for? Hello, I just realised I called you Tom in that last comment. That was quite silly of me, as that is not your name… Sorry about that! I foraged for mussels 🙂 Lots of fun. Hoping to start foraging Hedgerow things soon! Yes – hedgerow goodies will soon be sprouting up here, there and everywhere. In fact, some already are – it really is a very mild winter we’re having, so expect those first little shoots starting to appear about a month or more earlier than a lot of the literature suggests. That Hemlock Water Dropwort (deadly, by the way) I found was huge – certainly not a youngster. Good luck!